Incoming Prime Minister Hesham Mohamed Qandil said Tuesday that his cabinet would be made up of technocrats, adding that he has begun consultations to choose the rest of the cabinet within days. Qandil said that the new government would give priority to President Mohamed Morsy’s 100 day plan. “We are going through a difficult stage and face many challenges, including economic and security problems. The bottom line is the 100 day plan, and we will build on the past as well,” Qandil said. 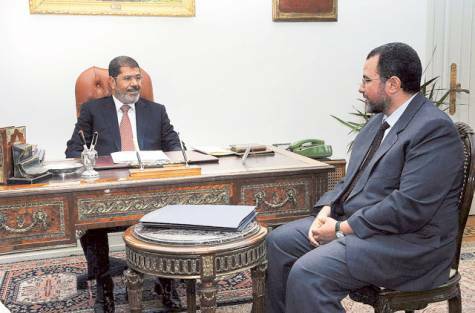 The new prime minister urged Egyptians to work, be patient and support Morsy. “We have great trust in the Egyptian people. We hope to restore the Egyptian spirit to make Egypt an advanced country and give the Egyptian people the life they deserve,” he added. Morsy is consulting with the military council over candidates for sovereign ministries like Defense, Qandil said, adding that ministers will be chosen collaboratively. Qandil assured that security is improving in the country and the ongoing problems can be solved.